Outdoor Adventure Education: What is Outdoor Adventure Education? This is an excerpt from Outdoor Adventure Education by Alan Ewert and R. James Sibthorp. The English word adventure comes from the French term aventure, which evolved from the Latin term adventurus, which means simply “about to arrive” but which over time has come to connote an exciting event that contains elements of risk and/or danger and where the outcome is uncertain. The term adventure is broad enough to cover any enterprise potentially fraught with risk, such as a business venture, major life undertaking, or even trying a new restaurant. But for our purposes in this book, and relative to OAE in general, adventure will imply a pursuit in an outdoor setting within an educational context. A search for excellence, an expression of human dignity, an act of the whole person. The concept of adventure implies not only action and intensity but also returning triumphantly, coming home, re-entry. This re-entry includes a period of telling, of piecing together, of sifting the meaning of the story (Nold, 1978). Most agree that adventure involves uncertainty. Priest and Gass focus on the nurturing and social aspects of adventure, citing how people are changed both within themselves and in their relationships with those who experienced the adventure with them. Joseph Nold speaks of the coming back, the idea that no adventure is complete without the telling of the tale. This telling, and retelling, of the story evokes the archetypal adventure story, the encountering of unforeseen events of which the outcome is uncertain, and upon return, sharing the story with others. Think of one of the first great adventure stories, Homer’s Odyssey, a recounting of the adventurous exploits of the Greek soldier Odysseus (known to the Romans as Ulysses), and how many times this tale or similar ones have been retold. Adventure has long played a critical role in human development, but only recently have adventure and outdoor experiences shifted from necessary or utilitarian to primarily recreational. Consider the risk and danger our ancestors faced in getting close enough to kill a wild animal with a spear. In many ways, as technology has allowed humans to gain greater advantage over their natural environment, the world has become a far safer place, with a greater assurance of securing food, at least for some. With the advent of mechanization, our relationship to risk has significantly evolved with most outdoor adventures usually not becoming matters of personal survival. Where we once accepted risk in order to survive, we now pursue risk in order to thrive—to feel as though we are making the most of our lives. During this shift in our perspective on risk, the field of OAE originated. Because it can be applied in a variety of settings and situations and because it remains true to the original concept of adventure, we use the following definition of OAE: A variety of teaching and learning activities and experiences usually involving a close interaction with an outdoor natural setting and containing elements of real or perceived danger or risk in which the outcome, although uncertain, can be influenced by the actions of the participants and circumstances. Let’s look more closely at our definition of OAE. First, in the teaching, learning, and experiencing that occur in OAE, education is of primary importance. 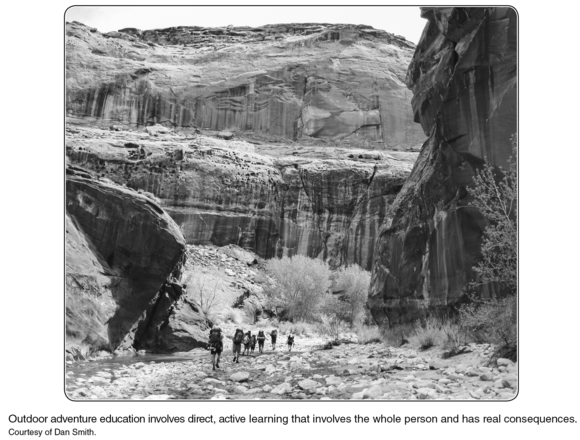 Wagstaff and Attarian (2009), for example, suggest that OAE instructors serve three functions in the realm of adventure education: facilitating the experience, safeguarding the experience, and minimizing the impacts on the natural environment. Of course each of these functions involves making the experience as educational as possible for all participants, taking advantage of every opportunity to teach the hows, whens, and whys implicit in each experience. In a sense, OAE instructors often strive to explain the adventure activity in addition to actually doing the activity. Second, note the (typically) close interaction with the outdoor environment. Although some climbing walls and rope course facilities are indoors, a natural setting serves as a key component in the education process for the vast majority of OAE programs—for reasons we shall explore later. Third, in our definition and most others, OAE typically contains elements of real or perceived risk. Risk can be real and inherent to an activity, such as a rock fall in a rock-climbing area, or can be merely (mis)perceived by participants within a safe activity. That is, instructors can manage an adventure site to make activities seem risky when in fact there is a very small chance of actual injury or loss. One example is employing a top rope in rock climbing where there is little chance of rockfall and a competent person is belaying the climber. For the participant, it often seems quite risky and dangerous when, in reality, the activity is quite safe. Fourth, in our definition of OAE, outcomes tend to be uncertain. Such factors as weather, terrain, participant abilities and attitudes, and equipment can make program outcomes quite unpredictable. Uncertainty plays an important role in adventure programs primarily because of what it can teach participants. Although often psychologically uncomfortable, uncertainty can force participants to confront their anxieties, analyze their decision-making abilities, and assess their physical, emotional, and leadership skills. Of course the amount of risk involved in uncertain outcomes can be significantly influenced by the skills of the participants. Participants can use their intuition, training, personal abilities, and team resources to make good decisions and take effective action to deal with uncertain outcomes. Circumstance and luck also play roles in uncertain outcomes. The ability to make accurate decisions tends to be largely affected by circumstance. Despite ambiguity inherent to many situations, the goal is always to gather as much information as possible, analyze the situation, make an informed and careful decision, and take the best possible action given the circumstances. Learn more about Outdoor Adventure Education.